Is your garden overflowing with tomatoes? Or do you have some less than perfect specimens that aren’t really pretty enough to serve in your salads? Making homemade marinara sauce is the perfect answer. Supposedly plum tomatoes (or roma tomatoes) make the best sauce, but I use whatever I have around. My last batch of tomato sauce was simply a collection of tomatoes too ugly to be served in public. To get the tomatoes ready to be simmered down to a tasty sauce, you first have to peel and seed them. Step 1: Bring a large pot of water to a boil. 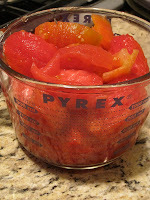 Prepare the tomatoes by cutting off any inedible portions and remove the core. You can also make an ‘x’ in the bottom of the tomato to help aid the peeling process. 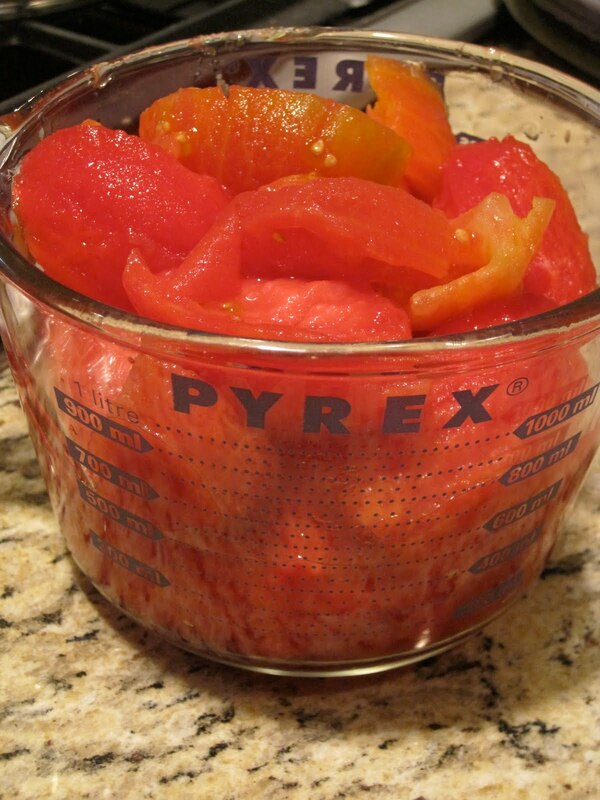 Step 2: Prepare another large bowl of ice water to shock the tomatoes as you pull them out of the boiling water. The tomatoes only stay in the boiling water for a minute or two, so you will need to have the ice water bath ready before you put the tomatoes into the boiling water. Step 3: Place the tomatoes into the boiling water – only about 6 or so at a time. Using a slotted spoon, gently drop the tomatoes into the water and watch them closely. Depending on the size, it will only take 1 or 2 minutes for the skin to start to pucker up or wrinkle. As soon as you see the skin start to wrinkle, remove the tomatoes from the boiling water and place them into the ice bath to shock them. The goal is to remove the skin but not actually cook the tomatoes. The ice bath will stop the cooking process. Step 4: Remove the skin by gently peeling it away from the tomato. Also remove most of the seeds – without losing too much juice. I usually only minimally attempt to remove the seeds and don’t find that it affects my sauce in the end. Step 5: Cut the tomatoes into large chunks, ready to be simmered for sauce. I rarely have time to prepare my tomatoes and simmer a sauce on the same day so I pop the prepared tomatoes into the fridge and get around to making the sauce on another day. My dad would actually prepare large quantities of tomatoes and then put them in freezer bags to prepare the sauce as needed weeks or months later… preferably when there was snow on the ground and the outline of our summer garden was no longer visible. 1. Saute 1 large onion, thinly sliced, in about 1 to 2 tablespoons olive oil until it is almost caramelized (very brown) – don’t cook it on too high of a temperature or the onions will burn. 3. Add in a combination of your favorite Italian dried herbs – rosemary, oregano, basil, thyme – about 1 tablespoon each. Add in a dried bay leaf if you have it. Dried herbs are better to use when you plan to simmer your own sauce because the flavor holds up better. If you want to use fresh herbs as well, put them in almost at the end of the simmering or when you reheat the sauce to serve. 4. After the onions have been nicely browned and the garlic and herbs have been added, you can add in about 1/4 to 1/2 cup of red wine if you have it. Sometimes I have it, sometimes I don’t. If you have the red wine, scrape the bottom of the pan (deglazing it) while stirring for about 2 minutes or so. 5. Add the prepared tomatoes. Simmer on a very low temperature in a large pot for about an hour to 2 hours, gently breaking up the tomatoes and stirring occasionally. This is obviously a very basic recipe! You can add in additional veggies – carrots, zucchini, mushrooms, etc. or even meat if you wish. I sometimes find that I will simmer down my sauce, store it away for later, but when I go to thaw it or take it out of the fridge, I need to add a little bit of tomato sauce to thin it out. Possibly I over-simmer it the first time around! Play around with the recipe and I am sure you will find your favorite version. Enjoy!